The valence states of the reactants remain the same when they are transformed into the products. Hydrogen, chlorine, sodium, and hydrogen all stay at +1, while oxygen remains at -2. Each carbon atom (left of the reaction arrow) loses 4 electrons, while each oxygen atom (ditto) gains 2 electrons. Carbon is oxidized. Oxygen is reduced. Oxidation results when electrons are lost, reduction occurs when electrons are gained. There are differing degrees of oxidative power. 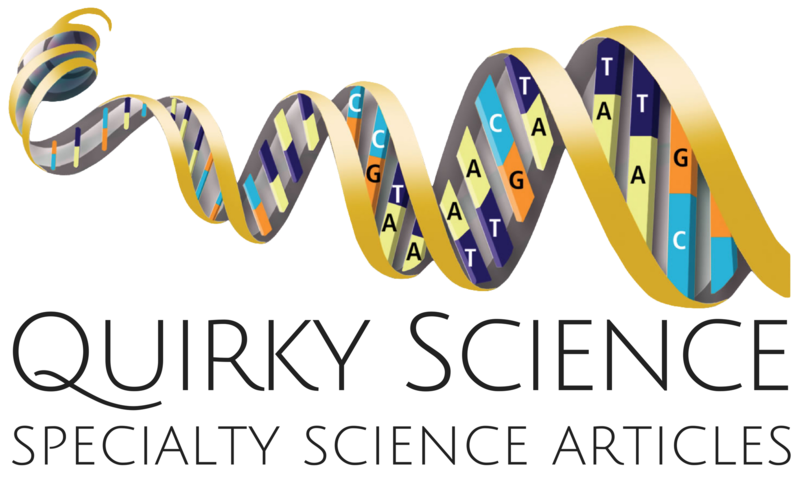 Curiously, some molecules contain an oxidizing portion plus a reducing portion. Some of this type of compound have the ability to react, violently – explosively – at the slightest provocation! It may take only a slight impact, an electric spark, even dropping, and Ka-Boom! In addition to its use as an explosive, nitroglycerin has a long history in the treatment of heart ailments, such as angina pectoris. 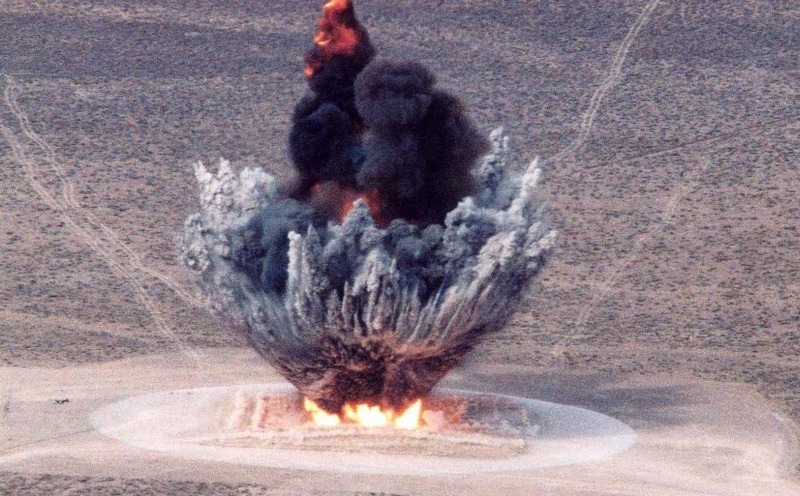 When it is used as an explosive, it is generally in the stabilized, solid form dynamite. Perhaps you noticed that nitroglycerin possesses 3 nitrate (-NO3) groups. 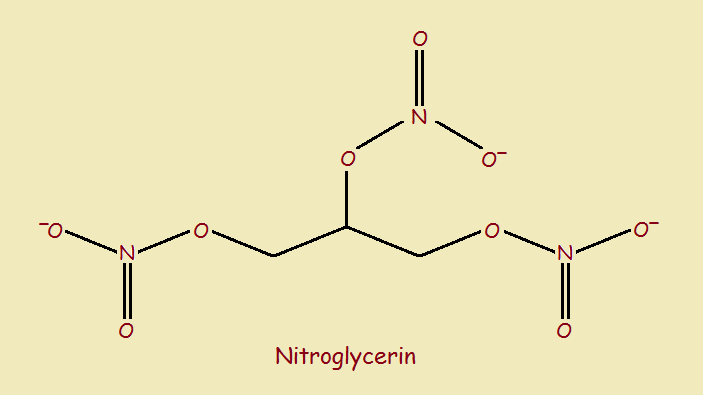 Strictly speaking, nitroglycerin does not have nitro (–NO2) groups, but nitrate groups. It is thus more accurately a trinitrate. TNT is safer to handle than nitroglycerine or dynamite, and is extensively used. One modern application, quite controversial, is in the process called fracking. Fracking is the use of explosive to blow up underground shale to release oil and natural gas deposits. Doubtless you noticed the above two examples consist of a small organic portion plus three nitro groups. Picric acid, or trinitrophenol, is no different. 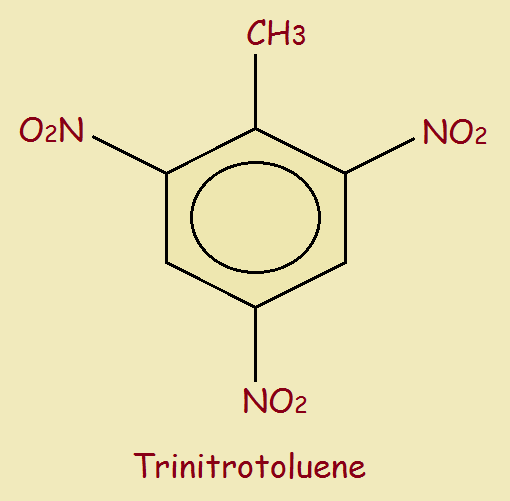 It closely resembles trinitrotoluene in its chemical structure. 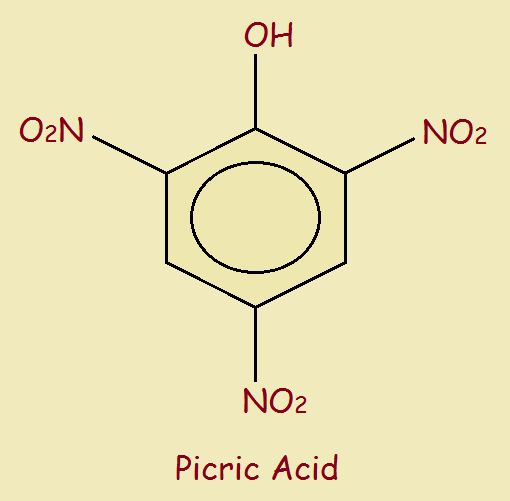 Picric acid received considerable use in bombs and grenades used in World War 1. One curious property of picric acid is its powerful acidity. Most acids readily lose one or more hydrogen ions. Hydrogen ions, H+ lack an electron. A molecule of phenol already possesses a fair degree of acidity. It tends to lose a hydrogen ion when in the correct surroundings. But that tendency is much magnified in the case of picric acid. Organic chemists refers to nitro-groups as electron withdrawing. There is not one, not two, but three such electron withdrawing groups (EWG) on a molecule of picric acid. They reduce electronegativity on the oxygen atom of the phenol group, thus favoring the leaving of the attached hydrogen. The easier it can leave (and the more stable the negative ion remaining behind), the stronger the acid. Since trinitrophenol possesses high acidity, it can attack metals and produce salts called picrates (see the acid-base reactions mentioned in the introduction). Metal picrates are often more unstable than picric acid. It would be a major mistake to store picric acid in a metal bottle! Even stored in glass or plastic, it is very unwise to store pure, dry picric acid. If it is stored at all, it is usually stored wet. Two common commercial picrates are potassium picrate and lead picrate. Although potassium picrate is more sensitive than picric acid, it is not a very powerful explosive. It is typically used in fireworks. It is formed by neutralizing picric acid with potassium carbonate. Lead picrate can be formed by the combining of red lead (Pb₃O₄) with picric acid. It is much more sensitive (watch it!) and is used for its detonating properties. For purposes of demonstration, very tiny quantities only should be formed, and then, by qualified instructors.